i am super excited to share with you some photos from the english countryside and offer you a delightful giveaway. today i spent the day with my dear friend caroline , who loves walking in the countryside as much as more than i do and always obliges me with a walk when i escape to visit her in her slice of english paradise. today, we were dropped off at west meon and spent a lovely i-have-no-idea-how-long wandering back through quiet country lanes, bridleways and ancient woodlands to her home at brockwood park. and watched over us as we wandered quiet bridleways. i was so very happy to have this time with caroline; slowing down, catching up on each other’s lives, just happy to be together where words are often unncessary. she is a welcome & essential part of my tribe. 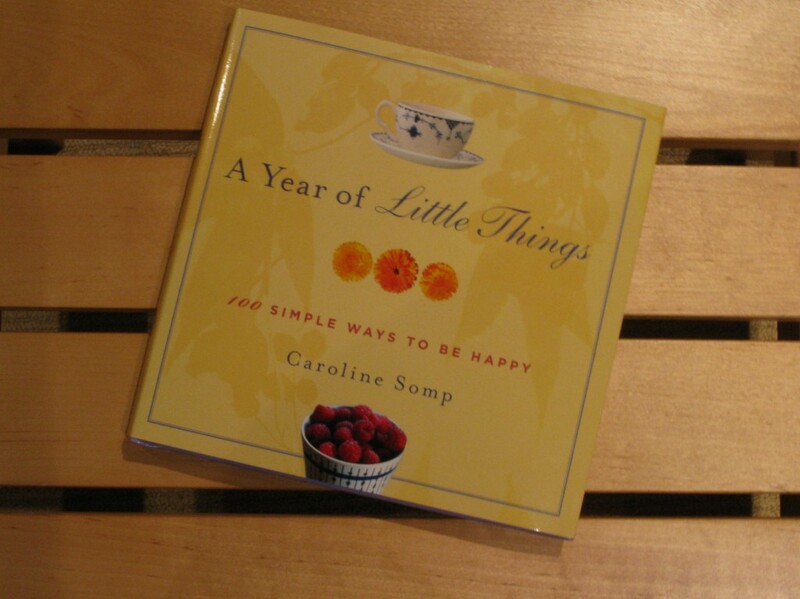 caroline has also recently had a book published (YAY caroline!!!) and i would like to give one of these to YOU. 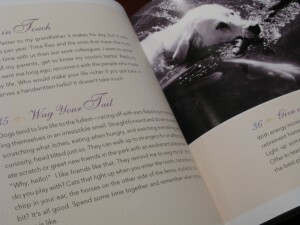 the book, called A Year of Little Things: 100 Simple Ways to be Happy (also available on amazon.com) is an invitation; to dream, bring nature inside, see, wag your tail, dance, be utterly ridiculous and 94 other simple things. to enter, please just leave a comment telling me what one of your favourite simple ways to be happy is. entry is open to all, so please do share this with your friends. entry is open until monday 1st march. winner will be drawn at random on tuesday 2nd march and notified by email. This entry was posted in six years in london, travel, uk and tagged canon g9, england, friends. Bookmark the permalink. 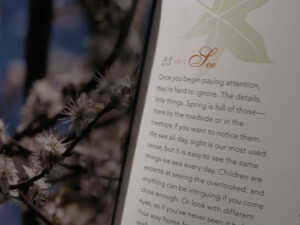 The changing seasons make me happy…especially now, as the cherry blossoms are painting the trees a soft pink. Is that the same Caroline from My Pocket?? Oh I must go visit her! It’s been way too long. What a beautiful little book! I’ve kept visiting My Pocket wondering what happened to Caroline, I’m so pleased to see she’s published a book and has another site. Good for her! Perhaps you are next, Leonie? For me a simple way to be happy is to wake up early on the weekend and just enjoy being tucked between my sleeping husband and dog, reaching over to pick up a novel and read for a while and then falling back to sleep with them for a little while longer. Honestly, just a walk outdoors with my pooch (off leash preferably because I love to be able to watch her wander freely, running & sniffing & exploring). My favorite simple way to be happy is to smile. Whenever I’m not feeling good, or I’m grouchy and irritable, I try to take just a moment to smile. Often I think about my partner and our love. It works almost instantly. Nothing lifts the spirit like love. Thanks for your generosity in this giveaway. And I love the photos! your stroll with your friend sounds so good. I could consider this being a perfect day ! I love walking with a good friend. So glad you had a lovely weekend. Drinking a cup of hot tea, with some sort of sweet treat to accompany it, wrapped in a blanet with a good book/mag or film. Thanks for the giveaway! something simple, that makes me happy? In my Belgian world … happy has to be about a nice red wine. oh honey, gorgeous photos. that flower…oh man. one of my favorite simple ways to be happy is to share a hike with a friend, especially the part where we sit on the mountain top, muscles sore and body still, taking in the view and not needing to say anything. swimming under a fullmoon in balmy Caribbean waters. that snowdrop is so, so lovely, pity I never knew about the detail! first, those pics are breathtaking!!! & i’m loooooving the snowdrops especially! i once saw them painted on a russian laquer box & was stunned & sooo drawn in..oh leonie.wise!! ok, so that sure makes me happy! i would add that creating makes me happy…i think because of geniunely being myself, partaking in beauty, and offering love to others in the process. Drinking hot chocolate on our creaky old sofa while wrapped in a soft blanket on a freezing winter’s evening is my idea of simple bliss. By the way — beautiful shots, lovely. my favourite way to be happy is to lie on top of a hill and watch the clouds as the go by…! Or jump in big muddy puddles…!